Previously, on MinerBumping... We examined three different buckets of autopiloter tears, each one revealing a serious character flaw shared by the non-compliant carebears. For the fourth and final "bucket", we have the carebears of the highest caliber. It is our Agents' fondest wish that the carebears they gank will abandon their bot-aspirant ways and take up the fine art of PvP. Even if a rebellious carebear attempted to seek revenge against an Agent, that would be a better result than if the carebear spent the rest of his days AFK mining. However, there's a problem: The carebears who make these veiled and not-so-veiled threats of revenge never act on them; they remain bot-aspirants. Thus, the best carebears must be of a different kind entirely. I speak, of course, of the grateful gank recipients. To the skeptics and Anti-Gankers out there, this comes as a great surprise: Many people who get ganked actually thank the person who ganked them. And they mean it! Messages like these shouldn't take anyone off guard. EVE Online is a PvP game. Besides bot-aspirants, EVE attracts people who want to see spaceship combat--even at their own expense. And, lest we forget, ganking improves player retention. It only stands to reason that people should have some positive feeling about being ganked. Moreover, the truths of the Code are undeniable. So why bother denying them? Agents of the New Order are also known for their great wit. Good people enjoy being around Agents, even if it involves getting shot by them. Highsec is watching, carebears, and you will be judged according to how you respond to your losses. And Jamey is basically recycling old content, over and over and over again. He is desperate for blog hits even has him and his CHODE. slaves become more and more irrelevant to the vast majority of EO denizens. Are you getting saltier, Chodeanon? A new shardani is in the making and you read his tears here first. Please keep your minor safe. While I support player created content, I do wish that CODE would quit regurgitating the old and logically faulty conclusion that CCP Rise's talk proved that ganking improves player retention. I already see changes being made in EVE gameplay following the implementation of the new data mining abilities; changes to issues that have long (5+ years) been complained about, but never addressed because they ran against the narrative that CCP has always championed. Please continue your campaign of educating afk and too compliant pilots in proper EVE protocol, but please quit advocating that your activities are aiding pilot retention. You are simply removing the opportunistic weeds growing in the EVE garden....like any other hoe. Nobody cares about changes to bot-aspirant game mechanics. Stop whining and keep exploding crybaby. * Kusion = bots = CHODE. slave = hypocrite. The Code is as true today as the day it was written. I am continually astounded by the foresight, nay, prescience of the One who penned it over six years ago. - Upon being suicide ganked, a miner should congratulate the ganker on his success. Controversial, perhaps inconceivable to some when it was written, this simple clause encompasses both good sportsmanship and willingness to embrace loss, which are known to be key characteristics of high caliber players. When CCP dropped the bombshell news that ganking does not hurt, but rather improves player retention, it was a surprise to everybody except the One. Some anti-ganking hardliners are still in denial to this day. The One is none other than James 315, Supreme Protector and Saviour of Highsec, the author of this very blog. Peace be upon Him. May His reign last a thousand years. Thank goodness we have been enlightened to hold the miners to a higher standard. "...sportsmanship and willingness to embrace loss, which are known to be key characteristics of high caliber players." I would even go so far as to say high caliber men and women. This latest series is great. Here is an interesting thing. Mr Stoner Smurf's kills seem to be all pods. 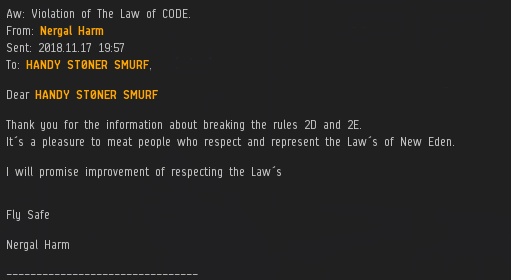 Surely not one of CODE's most able PVPers. Elite pvper is what you prefix when addressing an agent of the new order anon 2:39. The smurfs are lore in niarja. Lame or lazy pvper would be a better way to address this agent. Salty or sad is the best way to address you saltysadanon. I know it must be hard for you to admit you got owned in a video game by papa smurf. So hard you came here to cry some more about your ineptitude. Is your in game character name gargamel by chance? You sound to me like a bit of a pussycat. Defensive we are young padawan. The combat record of this agent brings no glory, only shame. Not something to draw attention to if you want to recruit more followers. Fact the facts, killing only pods is not elite pvp. Bad mistake drawing attention to this agent.